. : Farm Forest Line - Estimating the volume of a log on the ground:. If a tree has been felled and the bark removed it is relatively easy to measure log volume. However, there are a number of different equations that may be used. 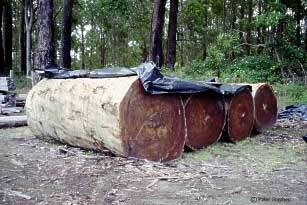 Farmers need to agree with sawmillers on one method before selling logs to the mill. Log buyers may dictate that log volumes be determined from centre diameters, small end diameters, an average of the diameters at each end or from the average cross sectional area at each end. Where the latter method may be more accurate, the others are much quicker and may better reflect log value. The table below shows a number of commonly used methods. Whilst Method 4 (the Smalian method) is generally considered the most accurate, Method 3 (the Huber method), based on the centre diameter, is more commonly used. Some millers may prefer Method 1. If the bark is still on the log, it must be accounted for when determining the diameters. This can be done by judging bark thickness using a knife or debarking the log at that point.